My paper presenting the [NII] 205 – 24 μm correlation is now on arxiv. My original aim for this work was just to produce a short research note to support part of the methodology in my recent paper on the edge-on spiral galaxy NGC 891. In this previous work, I exploited an empirical relationship to predict the [NII] 205 μm line emission from a higher resolution MIPS 24 μm image. Although this technique allowed me to expand my analysis, I disliked that section of the study because the underlying nature of the correlation was still unknown, mostly because of the uncertainties when dealing with high inclination systems. Integration along the line-of-sight through an edge-on spiral galaxy will include a range of physical environments, from active star-forming [HII] regions to diffuse ionised gas, making it difficult to interpret the origin of the relationship. I therefore wanted to test whether the [NII] 205 – 24 μm correlation had a physical origin or, in the most extreme case, was just an artefact of line-of-sight projection effects in an edge-on disc. We combined Herschel and Spitzer observations of face-on and interacting galaxies in the Very Nearby Galaxies Survey – M83, M51 and the Antennae galaxies, NGC 4038 and 4039. The four panels above show black contours of constant 24 μm continuum emission superimposed on the SPIRE FTS maps of the [NII] 205 μm line emission for each galaxy. 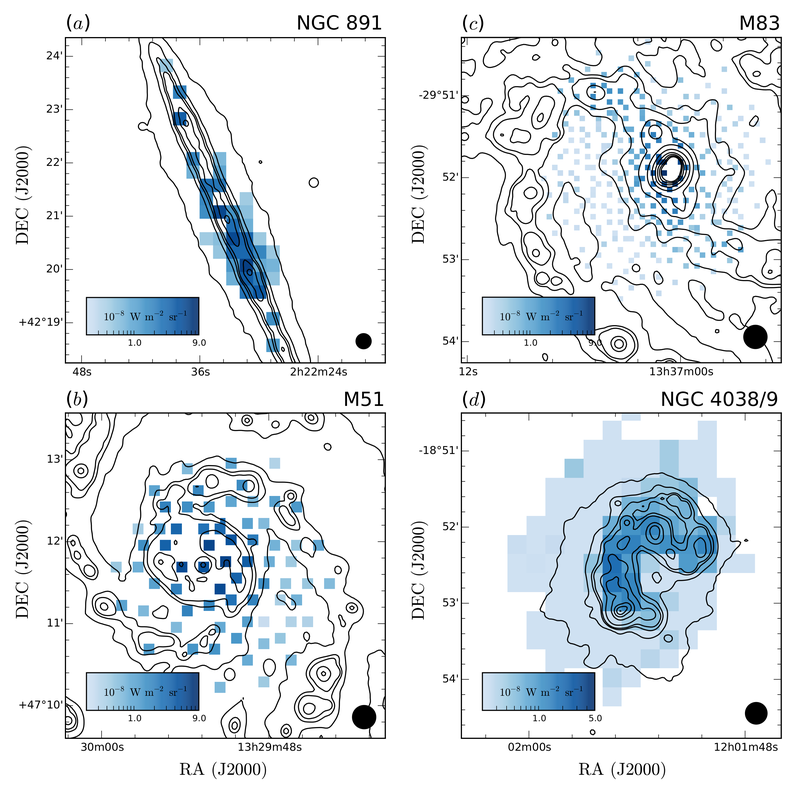 We found the same [NII] 205 – 24 μm correlation in these face-on systems, but also that the line emission correlates with the local star formation rate. Interestingly, offsets in the correlations between the ‘normal’ star-forming discs and the starbursts in M83 and NGC 4038/9 could be interpreted by a simple Starburst99-based model as differences in the gas heating efficiency and how recently the stars were formed. We present a general relation between the [NII] 205 μm line emission and the SFR density, but I would be cautious in using this line as a SFR tracer given these offsets. The article is now available on astro-ph, or you can download the PDF here. I’ll be using these results in a continuing project to analyse the Herschel far-infrared photometry and spectroscopy of NGC 2403, similar to my treatment of the NGC 891 observations. I’m also working on a new draft presenting my work to constrain the physical conditions in interstellar gas for higher redshift galaxies based on ALMA observations of their CO and [CII] 158 μm emission – watch this space for updates!